By the power of Grayskull, and also nostalgia! 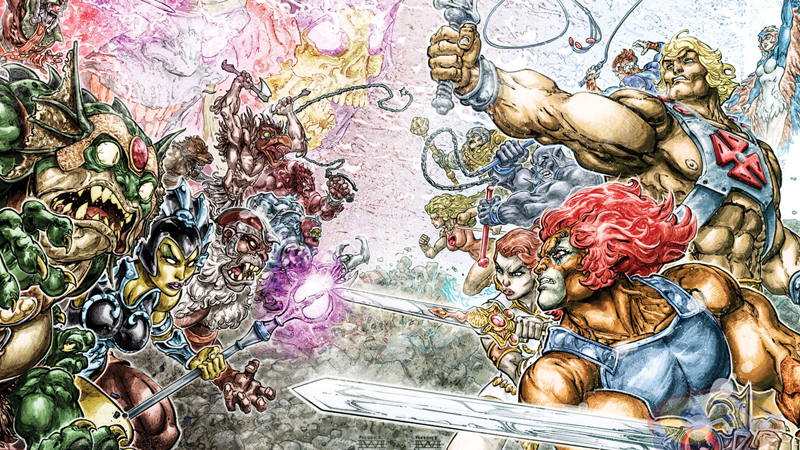 The Masters of the Universe are joining forces with the Thundercats for a brand new comic book miniseries later this year—a concentrated dose of ‘80s nostalgia so powerful, it might as well be time-travel. Revealed by Comic Book Resources today, He-Man/Thundercats will be a six-part miniseries in the vein of DC’s recent nostalgia-stoking Batman/Teenage Mutant Ninja Turtles crossover. Written by Mattel’s head writer on the Masters of the Universe franchise Rob David and his producer Lloyd Goldfine, with art from Freddie E. Williams II, the series will see Lion-O and his friends team up with He-Man after Mumm-Ra scours the multiverse in search of a weapon that could defeat the Sword of Omens, before setting his eyes on He-Man’s own power sword. DC is no stranger to He-Man comics, as they’ve been writing series for Mattel for the past few years, but this is the first time the Thundercats have been comic-bound since the early 2000s. Between this and the recent takes DC have put on classic Hanna-Barbera cartoons, DC is well and truly diving into some nostalgic corners for its comics.